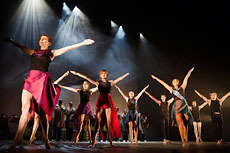 Celebrating 20 years of democracy in South Africa, INALA (meaning 'abundance of goodwill' in Zulu) presents choral legends Ladysmith Black Mambazo in a unique artistic collaboration with multi award-winning choreographer Mark Baldwin and world class dancers including talent from the Royal Ballet and Rambert. In this ambitious production, INALA embraces an exhilarating fusion of South African and Western cultures live on stage. Winners of four Grammy® Awards, Ladysmith Black Mambazo first rose to worldwide prominence with Paul Simon's Graceland album. 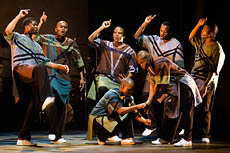 Ladysmith Black Mambazo blend the intricate rhythms and infectious harmonies of their native musical roots with live percussion, piano and strings. 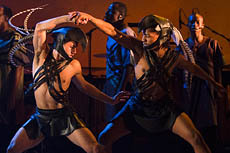 Mark Baldwin's richly visceral choreography unites Zulu traditions with classical ballet and contemporary dance, performed by an exceptional company of eighteen dancers and singers. 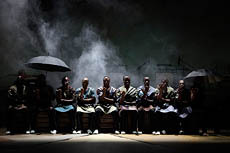 Embracing South Africa's past, its present and new hopes for the future, INALA delivers a spiritually uplifting and beautiful live story-telling experience, powered by a cultural explosion of music, song and dance. Choreographer Mark Baldwin, London 2014. Photography: Giulietta Verdon-Roe, costume design: Georg Meyer-Wiel.